A sponsorship contract is a legal manuscript that presides over the relationship between a sponsor and company or particular individual. Some Agreements are informal in nature, while large Simple Contract Template scale events and programs require formal documentation of the agreement. 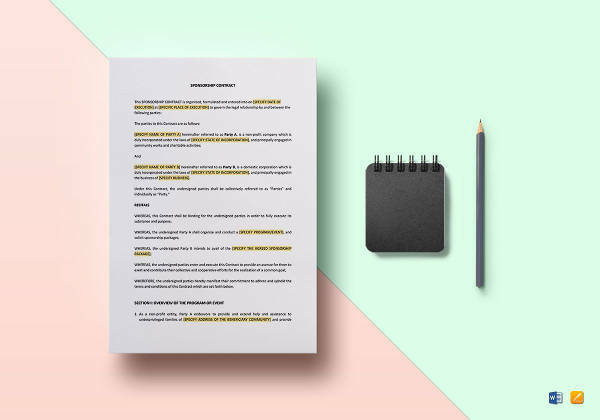 Here is a list of some sponsorship agreements which can help you to understand the premise of the job and draft an agreement accordingly as per your needs. 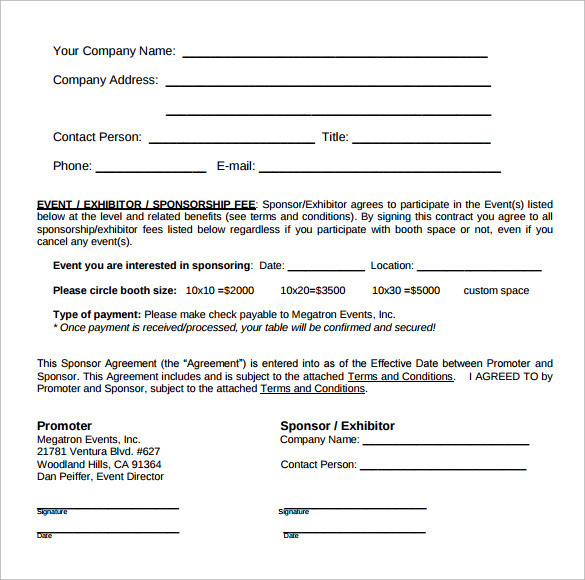 This sample of sponsorship contract template is a meant for organizers of a particular event seeking sponsorship from various business units. 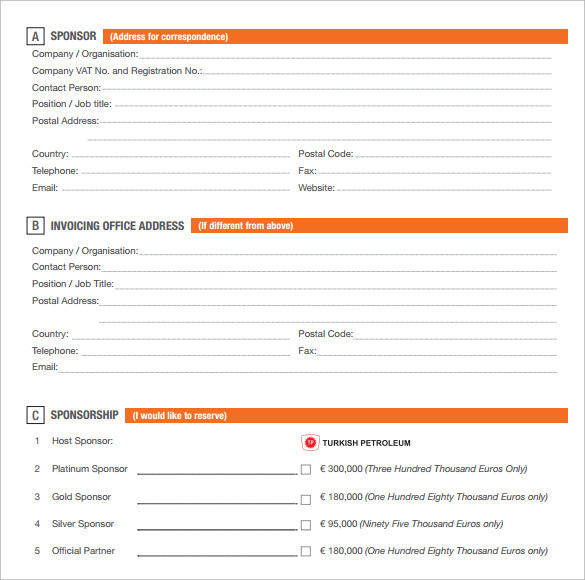 The documents specifies what makes the event an ideal place for sponsors to advertise and lists down the types of facilities the sponsors in different categories shall receive depending upon the amount of donation. 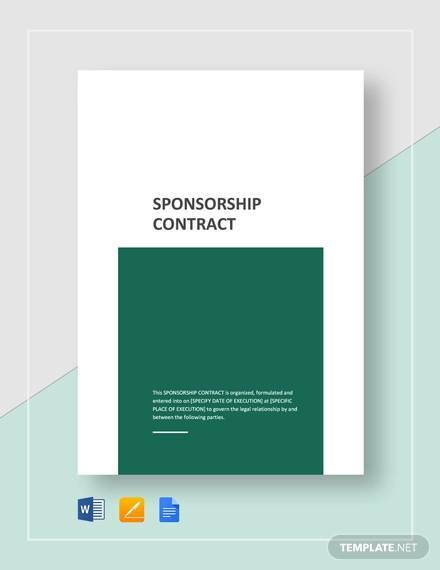 In this example of sample contract for sponsorship the contracts classifies the contract depending upon the fee structure and the facilities that they shall receive as part of the sponsorship program. The contract also has provision for solo and joint sponsorship programs for half a day. The sponsors can choose the time period and rate as per their convenience. The document has a form which the sponsors need to fill up and accompany it along with the money for registration purposes. This is a relatively simple tech sponsorship contract where the name, address and other details of the sponsored person is provided along with the details of the sponsoring company which includes details like the cause behind sponsorship and total cost of sponsorship. 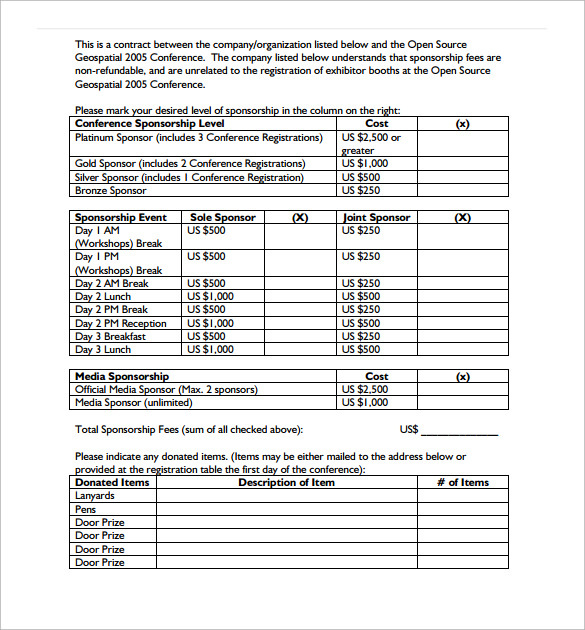 This sample of printable sponsorship contract is a very simple format that has the name, date and billing amount mentioned right at the beginning of the contract. It then lists down the terms and conditions for holding the event. The sample ends with a member billing authorization paragraph where the concerned member of the club needs to put down his signature. 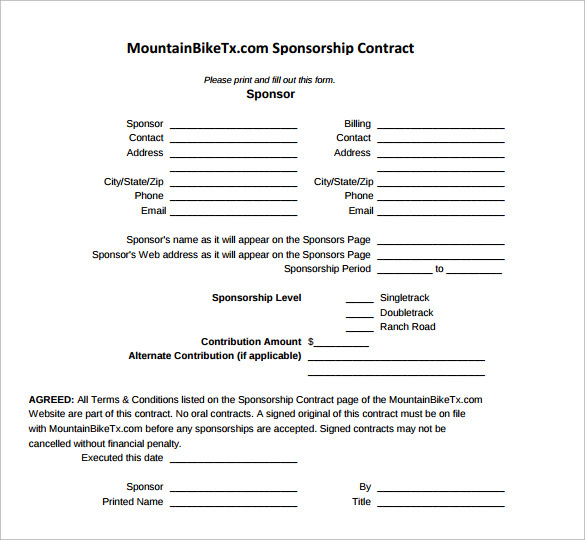 This simple sponsorship contract is divided into two sections. 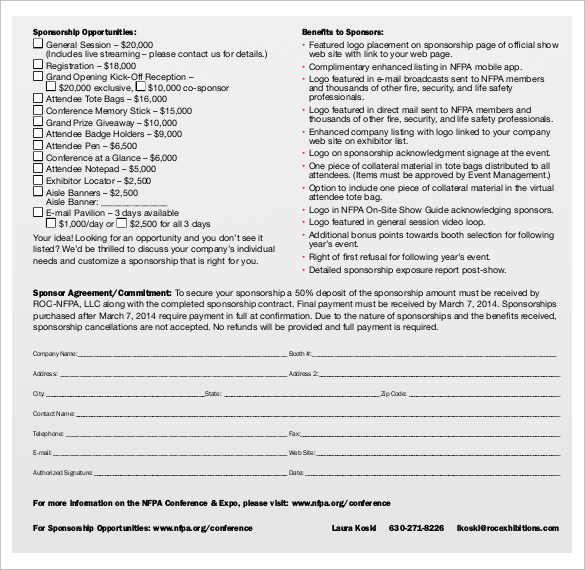 The left hand panel contains all the information regarding the sponsor, details regarding his billing details and payment method details. 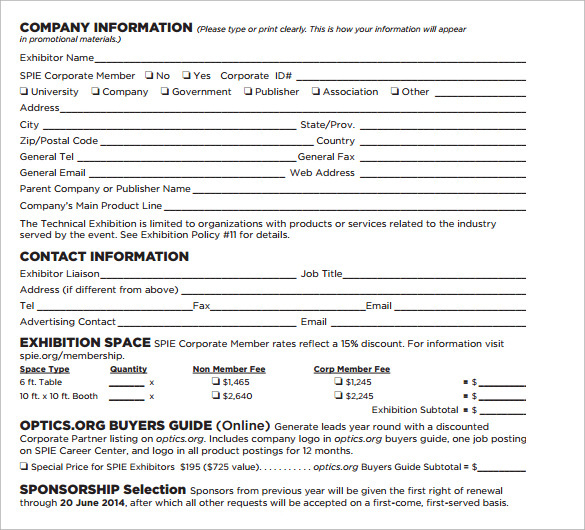 The right hand panel has details regarding the sponsorship type and mailing address of the company. The template ends with a set of specific sponsorship guidelines, sponsorship payment policy and a list of sponsorship benefits. 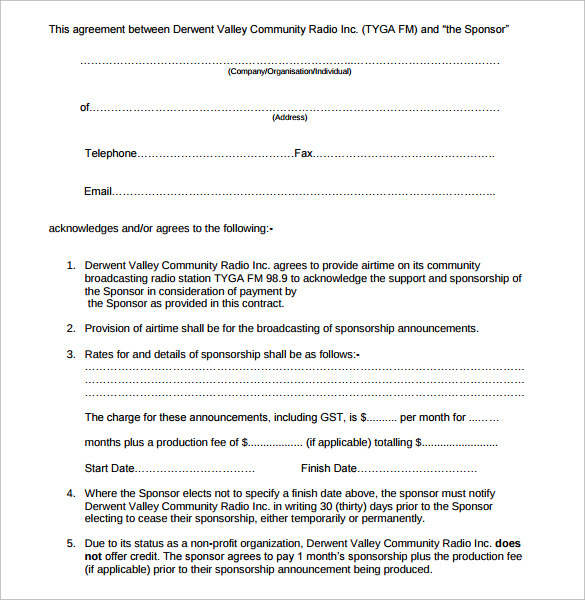 This sponsorship contract sample is very basic and simple example of sponsorship documents. 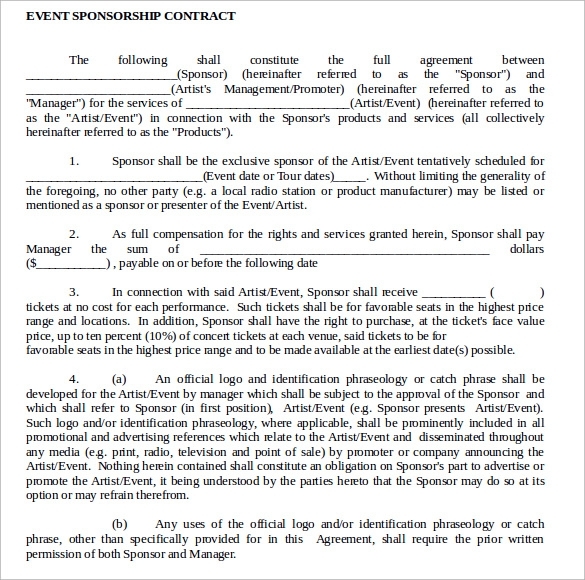 This sample lists down the terms and contracts of the sponsorship along with the name and details of both the parties. The provision of signature is given at the end of the page for both the parties. 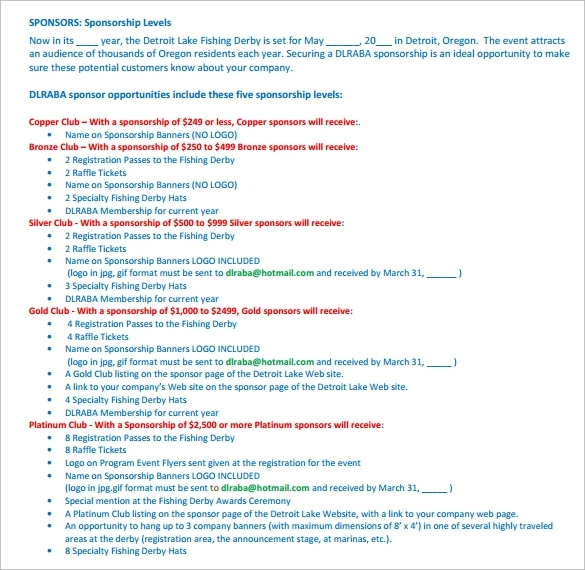 This example of sponsorship contract follows a double color scheme. The header is brightly decorated with eye catching images. The contract is divided into several sections. The first section contains details about the sponsor, the second section is dedicated to invoicing and office address. The third section is for payment method and timing and the last section is reserved for the terms and conditions of the contract. 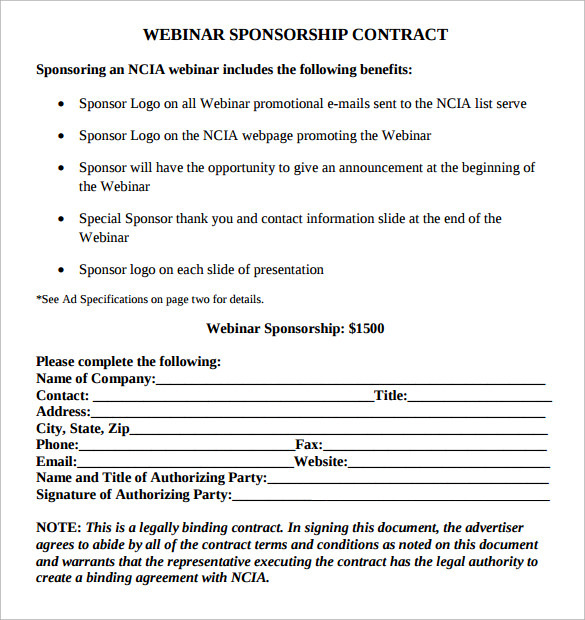 This webinar sponsorship contract example has a simple design. The template lists down the benefits of participating in this program. The second part is dedicated for gathering the details of the sponsoring company. The third part speaks about requirements while the fourth part is about terms and conditions of the sponsorship program. This sponsorship contract comes in PDF format and contains the name of the company, its address and other contact details. The second part is dedicated to the sponsorship fee structure and details regarding the type of advertisement that a sponsor wants to opt for. 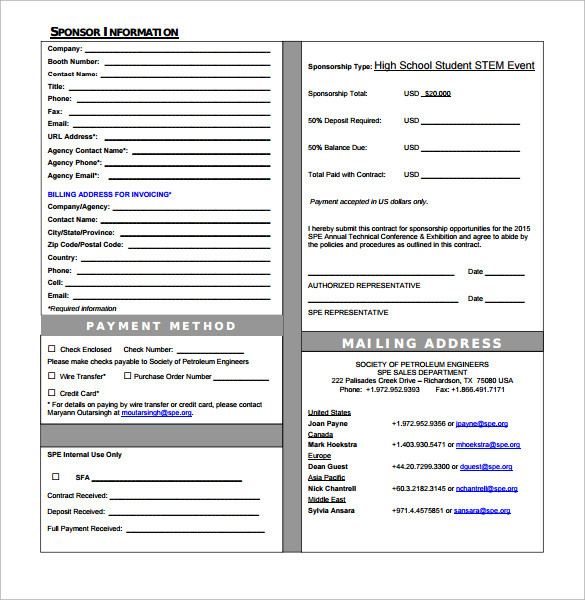 The provision for signature comes before the terms and contract page in this template. 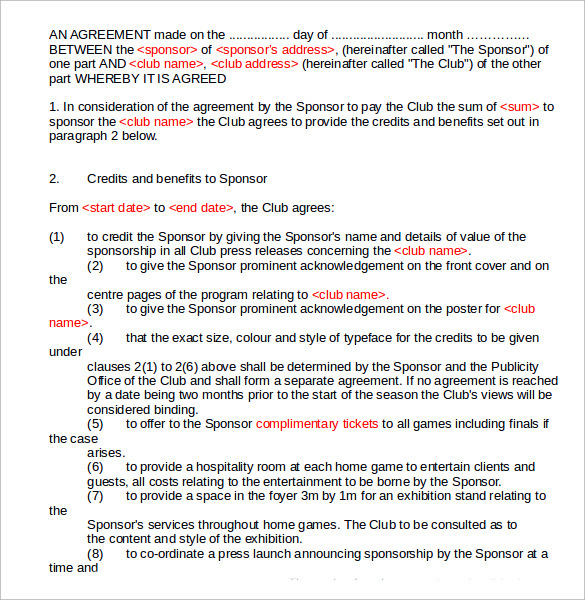 This sponsorship contract is designed on grey background and is available in PDF format. The contract is divided into two parts. The first part speaks about the various types of sponsorship opportunities, while the second part reflects on the benefits of sponsoring a particular event. 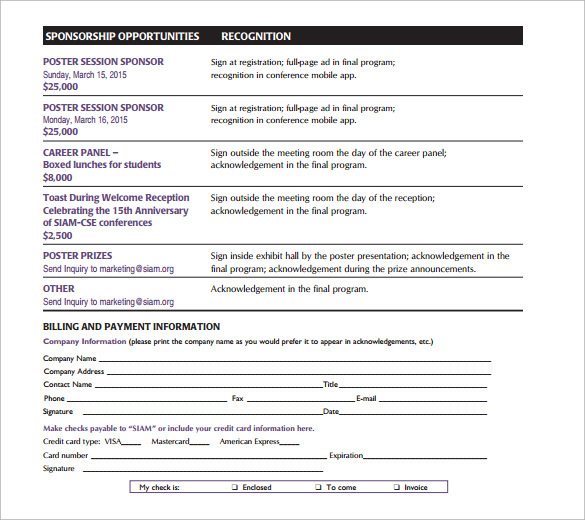 The bottom portion of the page contains space for filling up the details of the sponsor. Sponsors play a very crucial role in the success of any event. This sponsorship agreement would help you to maintain a good relation with your sponsor so that you can successfully organize crowd pulling events year after year.